Thursday night: Mostly clear. Lows in the 20s to near 30. Friday: Mostly sunny, southwest breeze. Highs in the 40s to near 50. Saturday: Cloudy, showers. Highs in the 40s. 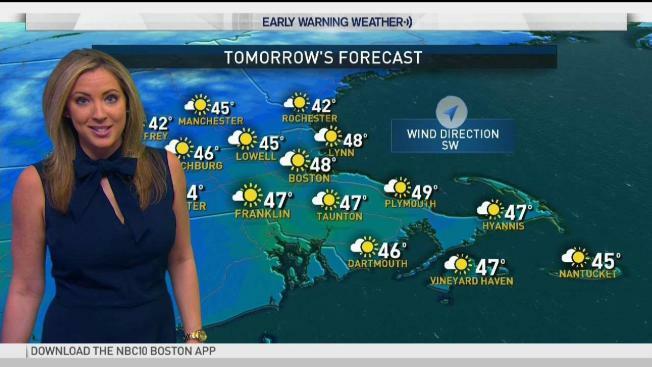 Sunday: Windy, mostly sunny. Highs in the low 40s. With mostly clear skies over New England Thursday night, a few may be lucky enough to see the Quadrantid meteor shower. The activity isn't very widespread, with just 25 meteors per hour in a dark sport, but keep an eye out for a "shooting star" just in case. The best chance of seeing one is roughly 9-10 p.m. Lows by Friday morning will be in the 20s and 30s. The above average conditions continue into Friday, with plenty of sunshine and highs for many in the 40s. There may be a few snow showers right along the U.S. and Canadian border, but those will be few and far between. Southwest winds will be busy, steady at 10-20 mph with higher gusts. The next storm to watch arrives on Saturday, mostly as rain. The precipitation will have a hard time making into northern New England, but there may be a few showers or a brief mix there — the wet weather will just be more widespread in southern New England. Still, most locations will pick up around a half inch or less. Highs will be in the 30s and 40s. Behind the storm on Sunday we will clear out, except in the mountains where upslope snow showers develop. Highs again reach the 30s to near 40. Monday is quiet before another storm approaches Monday night into Tuesday of next week. It's still early to know exactly what it will bring to New England, but there is a wintry potential with this. Several inches of snow are likely in northern New England Tuesday into Wednesday, with snow likely changing to or mixing with rain in Southern New England for a time. As the storm departs Wednesday, it would likely bring in some colder air, potentially allowing areas that mix to end as snow. The track will determine exactly who sees rain versus snow, and more importantly, how much.